The Mayor of Kazan instructed the deputies and officials to personally check the quality of school meals. I. Metshin: “Tatarstan has repeatedly proved that it is able to implement the most ambitious projects"
(KZN.RU, February 11, Ksenia Shvetsova). Last year, Kazan saved 1.2 billion rubles on purchases of municipal customers, unitary enterprises, and joint stock companies. It is almost 2 times more than in 2017. A few years ago, procurement was carried out by municipal structures independently. Today, thanks to the creation of the Directorate for Competition Policy and Procurement, it was possible to establish a clear order of interaction between the municipality and the budget recipient. 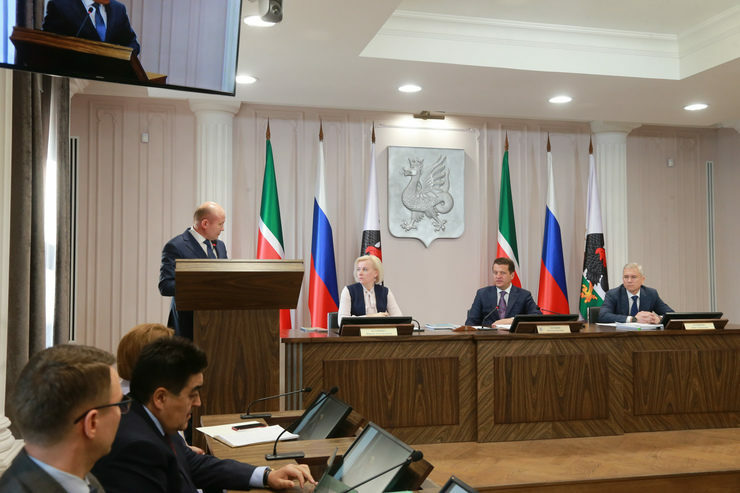 Ilsur Metshin, the Mayor of Kazan, announced this today at the Business Monday during the discussion of the main work results of the Directorate over the past year. Grigory Kharitonov, the head of the Directorate for Competition Policy and Procurement of Kazan, said that today the structural unit provides support for procurement activities from 650 municipal customers. Last year alone, municipal customers initiated 1225 competitive procedures for 5.4 billion rubles. Compared to the same period of 2017, the volume of municipal purchases decreased by 40%, and the number of procedures increased by 6%. “This is due to the conduct of large purchases in 2017, such as the reconstruction of biological sewage treatment plants, services to provide credit funds”, explained G. Kharitonov. The volume of available competitive procurement procedures for small and medium-sized businesses increased by 4.6%. At the end of last year, it amounted to 634 million rubles, or 12.1% of the total volume of competitive procedures conducted. The largest municipal customer last year was the Committee for External Improvement. The volume of purchases there amounted to more than 1 billion rubles. Budget savings on the results of public procurement amounted to 33 million or 3.2%. The bulk of purchases fell on the maintenance of roads, artificial structures and landscaping. The greatest savings were made in the procurement of the maintenance of artificial structures and irrigation systems. Other major customers were the city district administrations. The top five customers with annual purchases exceeding 10 million rubles, for which the largest percentage of savings was secured, were the Land and Property Relations Committee, the municipal system “Automated Road Traffic Management System”, the Department of Education, Kazan Zoo, and the Tourism Promotion Committee. Saving on bidding is possible primarily due to competition among potential suppliers. Thus, an average of 3 to 4 participants applied for one lot. The Directorate forms recommendations for customers as part of advising unitary enterprises and joint-stock companies of the city. Thus, experts give advice on optimizing the initial contract price, requirements for facilities, purchasing volumes and delivery terms. “Last year we reviewed 13410 applications from 14 unitary enterprises and joint-stock companies in the amount of 18.8 billion rubles”, said G. Kharitonov. and. The total savings amounted to 262 million rubles due to the preparation of recommendations for optimizing the procurement conditions. G. Kharitonov cited an example. As a result of adjusting the estimated calculations, 2 million rubles was recommended to allocate on request for the purchase of a pumping station for pumping water in Lebyazhie Lake for the amount of 2.8 million rubles. Thus, saving amounted to 28%. In general, the cumulative savings on purchases of municipal customers, unitary enterprises and joint-stock companies of the city amounted to more than 1.2 billion rubles. “This is a very good result, almost 2 times more than last year”, said Ilsur Metshin, the Mayor of Kazan. “To those who think that we are bathing in gold and money, I want to say that this isn’t the case. Saving 1.2 billion rubles is a huge amount for us. We are very pleased with the increase in the number of purchases among small and medium-sized businesses”, said the Mayor. He added that the legal framework in the field of public procurement today is imperfect and requires changes. “We are obliged to choose the minimum price, but the participants are not always fair. Sometimes they specifically drop the price, and then they can’t fulfill their obligations. All this slows down our rhythm, our plans, and the implementation of urban, republican programs. But we have to work in the situation as it is”. During the consideration of applications by MUP and AO, the experts of the Directorate monitors market offers of goods and services, analyze the restriction of competition, the reasonableness of volumes and the possibility of purchasing analogs that meet the needs of the customer. All this allows saving a lot of money, said G. Kharitonov. Similar work is carried out at the request of municipal customers. Thus, when coordinating the application for the purchase of equipment for robotics for multi-disciplinary school №181 in the amount of 2 million rubles, the Directorate’s experts found suppliers with more lucrative offers. The total savings amounted to 724 thousand rubles. Thus, the school, which opened just last year, had free financial resources and the possibility of purchasing additional equipment. At the end of 2017, a project commission was established in Kazan on the basis of the Executive Committee. Its main functions include reviewing and evaluating performance indicators, setting implementation priorities, developing recommendations on funding sources, and reviewing the actual results of project implementation. To date, the commission has reviewed 30 projects. This year, according to the speaker, it is planned to implement new procurement control activities for municipal customers, carried out with a single supplier up to 100 and 400 thousand rubles. “5-6 years ago, all city enterprises conducted purchases separately. The creation of the Directorate for Competition Policy and Procurement allowed to establish order in this area, having established interaction between the municipality and state beneficiaries”, said Ilsur Metshin. “It is important that not only officials, but experts in financial markets work in the Directorate. The work is coordinated, and most importantly transparent. We do everything in equal accessibility for all participants and continue this important work”, he concluded.